2 2. Describe the proper handling and storage techniques of disks, CDs, CDR’s, DVDs, Flash/USB drives, and other equivalent optical media devices. 3 3. Explain the difference between read-only, write once, and write-rewrite media. What are examples of each? 5 5. What are the advantages of increasing processor speed, hard drive storage capacity and RAM on a computer? 6 6. List two different types of printers and explain the uses and advantages of each type. 7 7. Explain how each of the following elements helps protect a computer system. Why is computer safety so important? 8 8. Write a 250-word essay or give a three-minute oral report about the history of computers. Include prominent events and personalities that are significant to the development of the computer, both hardware and software. This report should focus on the development of the personal computer, not the internet or other accessory functions related to computing. 9 9. Spend one week charting the time you spend on a computer. List what time was spent on schoolwork, gaming, online, etc. At the end of the week, evaluate with your counselor, family, or group leader how your management of computer time relates to the Bible’s instructions on stewardship of our time and resources (Romans 14:12; Psalms 31:15; Ecclesiastes 31:1-8; Ephesians 5:15-16). 10 10. Dialogue with a long-term computer user about the advantages/disadvantages of Macs and PCs. Some questions you should ask include:a. What operating system does each use? What are some advantages of that OS?b. What compatibility issues do these two types of computers have in relation to data sharing and program installation?c. What type of industries / careers tend to use each type of computer system? This Honor is a component of the Modern Technology Master Award. CPU is an acronym that stands for "Central Processing Unit." This is the "brain" behind a computer, and is where all the arithmetic, logic, and program flow is performed. Different RAM types. From top to bottom: DIP, SIPP, SIMM 30 pin, SIMM 72 pin, DIMM (168-pin), DDR DIMM (184-pin). RAM is an acronym that stands for Random Access Memory. "Random access" means that the contents of the memory can be accessed in any random order. The term was originally coined to differentiate it from serial memory (such as data stored on a magnetic tape). The contents of a serial memory could only be accessed sequentially. RAM is a volatile memory, which means that when the power is turned off, the information stored there is lost. RAM can be accessed very quickly by the computer. Its contents can be both read and written. Most programs on a computer are loaded into and executed from RAM. RAM is also used as "scratch space" where the computer stores the results of calculations. The mother board is located inside the main unit and contains the core circuitry of the computer, including the CPU. It also contains "slots" that other circuit cards such can be plugged into to add extra functions to the computer, such as a modem, networking, video acceleration, or a television tuner. The functions provided by these add-on cards (or daughter cards) are often absorbed into the motherboard as new technology is introduced. Modems, networking, sound, graphics, hard drive controllers, and USB adapters are examples of technology introduced as add-on cards, but now commonly found on the motherboard. A hard drive is a nonvolatile data storage device. It works by the same principals as a floppy disc, except that it is much faster, has much greater storage capacity, and is usually not removable from the computer. Most hard drives consist of several aluminum platters stacked on a spindle. The platters (or disks) are coated with a material whose magnetic properties are easily detected (for reading) and changed (for writing). The computer's operating system is usually stored on the hard drive as are most of the other programs the computer runs. Data stored on a hard drive will not be destroyed if the computer is turned off. An external drive is a storage device that is connected to a computer via a USB (or other) port. The drive itself remains outside the computer. The advantage of an external drive is that it is easier to install and it can be moved from one computer to another. This feature can be used for physically transporting large amounts of data between computers, or securing the data in an off-site location. An internal drive is a storage device that is installed inside the computer. The advantage of an internal drive is that it takes up less space and is generally more reliable than an external drive. USB stands for Universal Serial Bus. It is a convenient method of interfacing many different devices to a computer. USB devices include cameras, printers, flash memory drives, external hard drives, music players, and many others. USB ports are located on the back, front, or both sides of a computer, and sometimes even on computer monitors. A USB device is simply plugged into the port, and the computer recognizes the device and prepares it for use. An optical drive is a device which reads and optionally writes data to optical storage media such as CD-ROMS and DVDs. An input device is any device through which data can be provided to a computer. Input devices include, the mouse, keyboard, network card, storage devices, cameras, microphones. bar code reader (like at grocery store), iris scanner, thumb print reader, video camera, touch screen, pin pad, card readers, near field communication (bluetooth), security sensors, RFID reader, tap and go for credit cards, motion sensors, light sensors. A computer display, monitor or screen is a computer peripheral device capable of showing still or moving images generated by a computer. A computer keyboard is a peripheral modelled after the typewriter keyboard. Keyboards are designed for the input of text and characters, and also to control the operation of the computer. Physically, computer keyboards are an arrangement of rectangular or near-rectangular buttons, or "keys". Keyboards typically have characters engraved or printed on the keys; in most cases, each press of a key corresponds to a single written symbol. 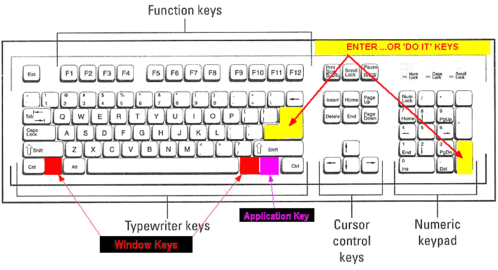 However, to produce some symbols requires pressing and holding several keys simultaneously, or in sequence; other keys do not produce any symbol, but instead affect the operation of the computer, or the keyboard itself. Roughly 50% of all keyboard keys produce letters, numbers or signs (characters). Other keys can produce actions when pressed, and other actions are available by simultaneously pressing more than one action key. A printer is a device for capturing the output of a computer on paper. A mouse is a device that is used by human operators to control a computer. It can be used to move a cursor on a screen, highlight data on the screen, "drag and drop" files from one folder to another, control the action in a computer game, and manipulate data in many other ways. Modem stands for Modulator/Demodulator, and it a hardware device which allows computers to communicate with one another over a telephone line (or some other audio channel). A network card serves the same function except that it connects to a computer network (such as ethernet) and is much, much faster than a modem. Modems are used for "dial-up" internet connections, and network cards are used for "broadband" internet connections. A digital camera is a device which digitally captures and stores an image in the form of a photograph. The photograph can then be transferred to a computer where it can be stored, transmitted to other computers, or digitally manipulated. A scanner is a device which is used to digitize a two-dimensional image, such as a printed photograph, a page from a book, or a store receipt. 3D scanners are now becoming common. 2. Describe the proper handling and storage techniques of disks, CDs, CDR’s, DVDs, Flash/USB drives, and other equivalent optical media devices. CD's, CDR's, and DVD's are all forms of optical media, and as such, must be protected from scratches. They are fairly impervious to water, and in fact can be cleaned with it (just be sure to completely dry them off before trying to use them). Store them in protective cases, envelopes, or some other container designed to store them. Flash/USB drives are incredibly durable and can take a lot of punishment. But that doesn't mean they should be abused. Though they are tough, they can still be crushed or snapped. Do not open the casing, as this will expose the internal circuitry to static electricity which can damage them. Unlike the optical media described above, flash drives can be damaged by liquids. 3. Explain the difference between read-only, write once, and write-rewrite media. What are examples of each? Read-only media is prepared at the factory and cannot be altered by the consumer. The most prevalent examples of read-only memory today are the CD-ROM and the DVD. Write-once media is blank when purchased and is written by the consumer. Once it is written to, the data on it cannot be changed. An example of write-once media is the CDR (or CD-R). Write-rewrite media can be written, erased, and rewritten by the end user. An example is the CD-RW. This type if media is generally more expensive than the CD, the DVD, or the CDR. In more modern times, the flash drive has taken the place of standard "Write-rewrite media. b. Storage capacity of the hard drive. Click the "Start" button. Then click "My Computer" with the right mouse button, and select "Properties". This will bring up a window. Select the "General" tab, and the computer will display the processor speed, memory capacity, as well as a number of other bits of information. To find the storage capacity, click the "Start" button and then use the left mouse button to select "My Computer". This will open a new window which will show all the drives on the computer. Generally, the "C:" drive is the hard drive, so right-click on that and select "Properties" - this will show you the drive capacity as well as how much of the drive is in use. Be sure to pay attention to the use of the left mouse button verses the right mouse button. Click on the "Apple" at the top left corner of the screen. Now click on "About This Mac". This will bring up a window that contains the processor type and speed and how much memory the computer has. To find the storage capacity on the hard drive, click the "More Info..." button. Now click on "ATA" under "Hardware". There should be two "ATA Bus" sections. Click on the bottom section or the one that doesn't contain anything about a CD drive. The hard drive capacity is under "Capacity". This output above indicates that the computer has a single hard drive with three partitions. The first of these is the root partition which has a total capacity of 20 Gigabytes, the second is 101 Megabytes, and the third is 16.7 Gigabytes. 5. What are the advantages of increasing processor speed, hard drive storage capacity and RAM on a computer? Increasing the processor speed of a computer will allow it to make more computations per second, thus improving its performance. Increasing the amount of RAM in a computer will also increase its performance, but for a different reason. When a computer program needs RAM, it requests it from the operating system (OS). If free memory is available, the OS assigns it to the program and all is well. If there is not enough memory to satisfy the request, the OS will copy the contents of some other program's RAM to the hard drive, and then give that to the requesting program. When the other program needs that memory again, the OS restores it from the hard drive (after writing the other program's version of the memory to the hard drive). This process is called "swapping," and it can really slow down a computer. However, all the programs continue to work as designed, and the computer makes maximum use of the resources available to it. Increasing RAM capacity will eliminate or reduce the amount of swapping that goes on. Increasing the storage capacity of a computer will not make it run any faster (as increasing the processor speed and memory capacity will), but it will allow more files and programs to be stored on the computer. 6. List two different types of printers and explain the uses and advantages of each type. A laser printer is a common type of computer printer that produces high quality printing, and is able to produce both text and graphics. An electric charge is first projected onto a revolving drum. The drum has a surface of a special plastic or garnet. Electronics drive a system that writes light onto the drum with a laser. The light causes the electrostatic charge to leak from the exposed parts of the drum. The surface of the drum passes through a bath of very fine particles of dry plastic powder, or toner. The charged parts of the drum electrostatically attract the particles of powder. The drum then deposits the powder on a piece of paper. The paper passes through a fuser, which, with heat and pressure, bonds the plastic powder to the paper. Laser printers are the workhorse printer of the business world. They are capable of producing very high quality prints very cheaply. Although most laser printers only work in black and white, some models can also produce color prints. Because of their speed and economy, laser printers have largely replaced all other types of printers except ink jet and thermal printers. Most current inkjets work by having a print cartridge with a series of tiny electrically-heated chambers. To produce an image, the printer runs a pulse of current through the heating elements. A steam explosion in the chamber forms a bubble, which propels a droplet of ink onto the paper (hence Canon's tradename for its inkjets, Bubblejet). When the bubble condenses, surplus ink is sucked back up from the printing surface. The ink's surface tension pumps another charge of ink into the chamber through a narrow channel attached to an ink reservoir. Compared to earlier consumer-oriented printers, ink jets have a number of advantages. They are quieter in operation than impact dot matrix or daisywheel printers. They can print finer, smoother details through higher printhead resolution, and many ink jets with photorealistic-quality color printing are widely available. The disadvantages of inkjets include flimsy print heads (prone to clogging) and expensive ink cartridges (sometimes costing US$30 – $40 or more). This typically leads value-minded consumers to consider laser printers for medium-to-high volume printer applications. A common business model for inkjet printers involves selling the actual printer at or even below production cost, while dramatically marking up the price of the (proprietary) ink cartridges. 7. Explain how each of the following elements helps protect a computer system. Why is computer safety so important? An important fact about modern computing is that computers eventually fail. If the hard drive on a computer fails, it may be difficult or impossible to recover the data that is stored on it. Forward-thinking computer users keep all of their important personal files backed up on external media so that when the computer fails, they still have their data. It is not nearly as important to back up program files, because the program can be re-installed when the computer is repaired or replaced. However, re-installing every program that a computer user needs can be a time-consuming and frustrating process. If the whole system is backed up, it can be restored in short order. The A/C power that feeds most businesses and households is subject to all kinds of disturbances that can disrupt or damage a computer. Lightning strikes can induce large currents in powrlines, and these translate into "surge" voltages. The increased voltage can easily damage a computer. Most often, this affects its power supply module. A surge protector is designed to absorb these voltage surges, preventing damage to the computer. An unfortunate fact of modern life is that the world is filled with evil (or immature) people who think it great fun to destroy data on a stranger's computer. Some of these people are capable of "hacking" their way into computer systems and altering files - even taking complete control of the computer. The computer can then be used to launch attacks against other computers. Sometimes this is done in order to install malicious software designed to analyze keystrokes. When the program detects that someone is engaged in online banking activities or ordering merchandise with a credit card, it springs into action, gathering account numbers and passwords which are then passed to the programmer. Once hacking was confined to a small community of immature, thoughtless programmers looking for a thrill, but it is becoming more and more an activity conducted by organized crime and rouge governments. Firewalls and antivirus software are designed to combat these operations, but in order to be effective, they must be installed and constantly updated. 8. Write a 250-word essay or give a three-minute oral report about the history of computers. Include prominent events and personalities that are significant to the development of the computer, both hardware and software. This report should focus on the development of the personal computer, not the internet or other accessory functions related to computing. Steve Wozniak and Steve Jobs are probably the most important people in the early history of personal computer hardware, as together, they formed Apple Computer which produced the first commercially viable home computer. Bill Gates and the company he founded (Microsoft) have had more influence on computer software than anyone else. Other people to know about include Brian Kernighan, Dennis Ritchie, Ken Thompson, Richard Stallman, Vint Cerf, and Linus Torvalds. 9. Spend one week charting the time you spend on a computer. List what time was spent on schoolwork, gaming, online, etc. At the end of the week, evaluate with your counselor, family, or group leader how your management of computer time relates to the Bible’s instructions on stewardship of our time and resources (Romans 14:12; Psalms 31:15; Ecclesiastes 31:1-8; Ephesians 5:15-16). Be very careful, then, how you live—not as unwise but as wise, making the most of every opportunity, because the days are evil. - Ephesians 5:15-16, NIV. There is a time for everything, and a season for every activity under heaven: a time to be born and a time to die, a time to plant and a time to uproot - Ecclesiastes 3:1,2, NIV. Likewise, there is a time to compute and a time to not compute. It is very easy to become addicted to computing, and as with all things, moderation is the key to temperance. a. What operating system does each use? What are some advantages of that OS? b. What compatibility issues do these two types of computers have in relation to data sharing and program installation? c. What type of industries / careers tend to use each type of computer system? With the importance of computing in today's world, it is highly likely that you know someone who could be described as "a long-term computer user." Perhaps a staff member in your Pathfinder club fits this description. Invite this person to attend a meeting to have this discussion. It would be a good idea to provide this person with the questions ahead of time to provide ample opportunity for preparations. This page was last modified on 24 February 2019, at 00:09. This page has been accessed 7,012 times.